Laura Incalcaterra McLoughlin, PhD, is a lecturer at the National University of Ireland, Galway, co-director of the MA in Advanced Language Skills and coordinator of the online Diploma in Italian. 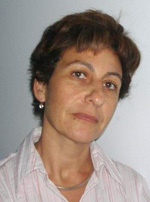 Her research interests include applied linguistics and audiovisual translation in language teaching and learning. She has published widely on language teaching methodology, language and new technologies and subtitling in language teaching and translator training. She has presented numerous papers at many international conferences. She won the European Language Label in 2008 and 2009.